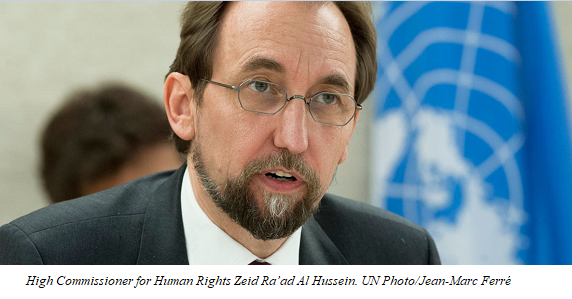 GENEVA (6 June 2018) – UN High Commissioner for Human Rights Zeid Ra’ad Al Hussein on Wednesday condemned the alleged extra-judicial killings of suspected drug offenders in Bangladesh and urged the authorities to ensure that these serious human rights violations are immediately halted and perpetrators brought to justice. Some 130 people have reportedly been shot dead by security forces across Bangladesh in the three weeks since 15 May and another 13,000 arrested. The killings began after the Government announced a “zero tolerance” policy to confront the growing consumption of drugs in the country, particularly the spread of methamphetamine. “I am gravely concerned that such a large number of people have been killed, and that the Government reaction has been to assure the public that none of these individuals were ‘innocent’ but that mistakes can occur in an anti-narcotics drive,” High Commissioner Zeid said. “Given the large number of people arrested, there is a high likelihood that many people may have been arbitrarily detained, without due regard for their rights,” he added. The High Commissioner called on the Government of Bangladesh to investigate the reports of extrajudicial killings, and stressed that there must not be impunity for human rights violations in the name of drug control. He was encouraged by assurances provided by Bangladesh’s Minister for Law, Justice and Parliamentary Affairs at a meeting in Geneva last week that investigations would take place and those found to be responsible for crimes would be held accountable. He urged the Government to follow through on this commitment, stressing that the investigations will need to be independent, impartial, transparent and effective. Zeid also expressed concern that already vulnerable communities living in slums were particularly being targeted and had been subjected to numerous raids. The crackdown has reportedly also seriously hampered the ability of people who use drugs to access health services, as they fear that they will be arrested or even killed if they seek treatment at Drop-In Centres. “There is no doubt that the trafficking and sale of illegal narcotics leads to tremendous suffering for individuals and entire communities, but extrajudicial killings, arbitrary arrests and the stigmatization of people who use drugs cannot be the answer,” the High Commissioner said. During its Universal Periodic Review before the UN Human Rights Council on 14 May, Bangladesh undertook to investigate reports of extrajudicial executions, arbitrary arrests and other serious violations. The developments since that date, with increasing reports of such human rights violations, are deeply worrying. The statement of the United Nations High Commissioner for Human Rights is available at the following link.